Ilsco ACO Dual-rated offset pigtail adapter in pink color, is rated at 600-Volts. 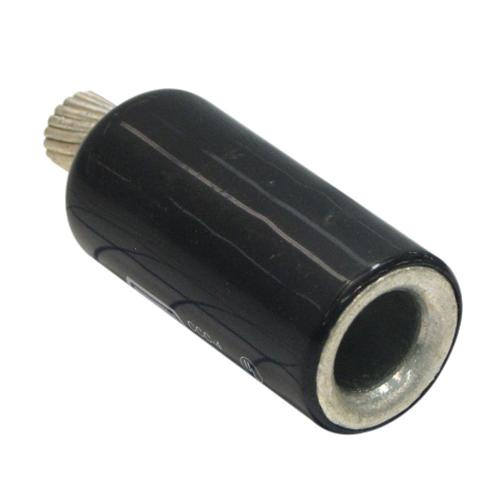 It has aluminum construction provides optimum conductivity and better crimping characteristics. Adapter accepts size 500-KCMIL conductor. It has size 350-KCMIL knurled pin that offers greater surface contact. This adapter is ideal for applications where multiple conductor lug hole spacing does not permit insertion of straight pin conductors. It has 2.03-Inch long chamfered barrel that provides easy conductor insertion. It withstands temperature rating of 90 deg C. Adapter pin measures 0.68-Inch Dia x 1.6-Inch. It measures 55/64-Inch ID x 1-21/64-Inch OD x 3-5/8-Inch. Offset pigtail adapter is UL listed, CSA certified and RoHS compliant.